AT THE post-Oscars press conference, having drunk six glasses of champagne, Spike Lee commented on the night’s big award. “Green Book” had just been named Best Picture (pictured), beating his film, “BlacKkKlansman”; “Every time somebody’s driving somebody,” Mr Lee quipped, “I lose.” His point was that “Green Book” was comparable to “Driving Miss Daisy”, a car-based race relations drama which won the Academy Award for Best Picture in 1990. In the same year, Mr Lee’s “Do The Right Thing” wasn’t even nominated, and yet “Do The Right Thing” has since been enshrined as a masterpiece of American cinema while “Driving Miss Daisy” is renowned as one of the worst films ever to win the statuette. If critics on social media are to be believed, the same fate is in store for “Green Book”. Set in 1962, Peter Farrelly’s comfortingly nostalgic road movie revolves around a black pianist (Mahershala Ali) and his white driver (Viggo Mortensen)—but, crucially, the film sees their tour of the Jim Crow South from the driver’s perspective. The message of “Green Book” seems to be that a black man has nothing to worry about so long as he has a white man around to get him out of trouble. You can see why Mr Lee might not be a fan, yet “BlacKkKlansman” is not as different as he might like to think: it, too, is based on a true story set in a previous decade, and it too hinges on an empowering black-white friendship. But “BlacKkKlansman” is confrontational enough to finish with footage of the white supremacist rally and car attack in Charlottesville, Virginia, in 2017, whereas the feel-good “Green Book”, which also won Best Original Screenplay, suggests that racism is a thing of the past. Putting that aside, though, this year’s Oscar ceremony was remarkably progressive. It was four years ago that the lack of black nominees spawned the social-media hashtag #OscarsSoWhite. There has been much talk since then about the Academy’s efforts to modernise and diversify, but this was the first year that Hollywood no longer appeared to be the domain of old, white, American men. The numerous awards given to Alfonso Cuarón, a Mexican film-maker, were only to be expected. “Roma”, Mr Cuarón’s epic drama about an indigenous domestic worker in Mexico City in the 1970s, netted trophies for Foreign Film, Director, and Cinematography; indeed, Mr Cuarón and his compatriots Guillermo del Toro and Alejandro Iñárritu have won the Oscar for Best Director in five out of the last six years. The awards won by Ryan Coogler’s Marvel superhero blockbuster “Black Panther” were more significant: Ruth Carter (costume design) and Hannah Beachler (production design) became only the second and third black women to win an Oscar in any category other than acting. 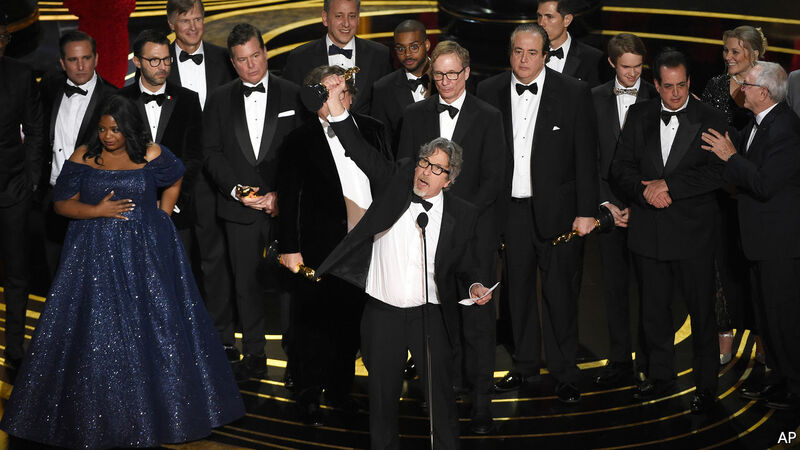 Similarly, Peter Ramsey, one of the three directors of the Best Animated Feature, “Spider-Man: Into The Spider-Verse”, was the first African-American to be nominated for that Oscar. Mr Ali, who was the first Muslim actor to win an Academy Award when he took home a trophy for “Moonlight” two years ago, won the Supporting Actor prize again for “Green Book”. Regina King won Best Supporting Actress for her forceful performance in “If Beale Street Could Talk”, Barry Jenkins’s lyrical adaptation of James Baldwin’s novel. Rami Malek, who won Best Actor for playing Freddie Mercury in “Bohemian Rhapsody”, mentioned in his speech that he was the son of Egyptian immigrants. The best documentary winner, “Free Solo”, was co-directed by Elizabeth Chai Vasarhelyi, whose parents are from Hungary and Hong Kong, and her husband Jimmy Chin, whose parents are Chinese. The winner of Best Animated Short, “Bao”, was written and directed by Domee Shi, a Chinese-Canadian. And the winner of best documentary short, “Period. End of Sentence”, concerns Indian villagers manufacturing sanitary pads. Rayka Zehtabchi, the director, said the win would help empower “women all over the world to fight for menstrual equality”. Beyond this unprecedented diversity, there was much to enjoy in Sunday’s upbeat ceremony. The decision not to have a host resulted in a faster, breezier event, and the surprise choice of Britain’s Olivia Colman as Best Actress for “The Favourite” cemented her status as a national treasure. There was also a prize for Mr Lee, who won for Best Adapted Screenplay—his first Academy Award in three decades. That should be reason enough for him to have another glass of champagne or two.